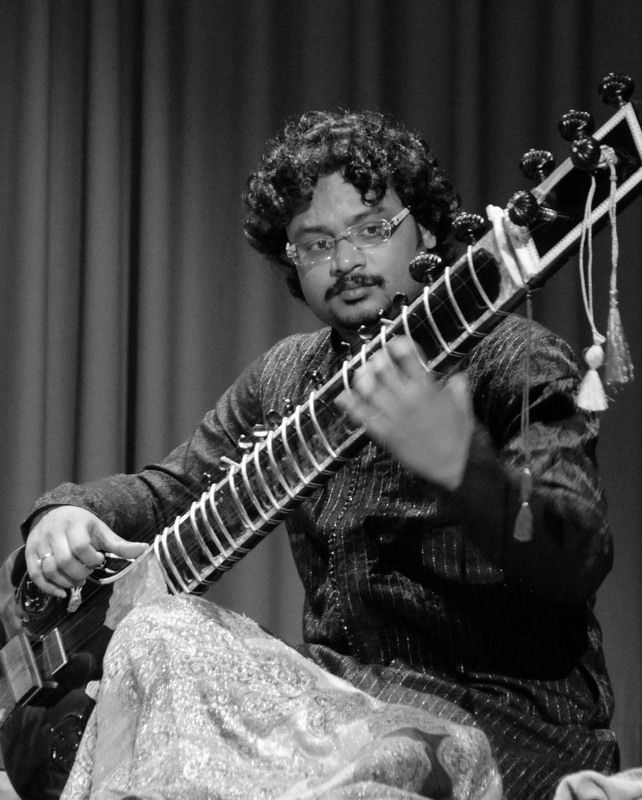 Rajib Karmakar is undoubtedly one of the finest young sitar players today. Years of learning have resulted in an extensive techniqueand deep understanding of diverse musical styles. His open mind has led to an extension of his musical horizon to incorporate imaginative experiments in world music styles that delight the young and the old. He has performed all over the world, in prestigious music concerts and festivals. He is the creator of the world’s first double necked electric Sitar ” Mayur Tantri” . Rajib’s versatility has ably adapted his classical knowledge and skill in his fusion projects like Wahh(USA), Fuzorhythm(India), Loop Science(Germany), Nada Naissance(France) etc. 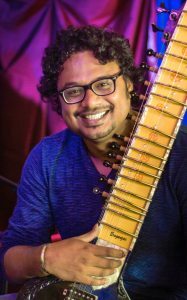 He is currently residing in Los Angeles, California as a performer, educator and digital artiste Rajib is performing frequently in India and abroad including USA, Germany, France, Italy, Switzerland etc. and has given performances in Festival of India(Ottawa), Boom Festival(Portugal), Hip-Hop Connection Festival (Austria), Festival De Papillotes(France), Ministry of Culture(Spain), European Yoga Congress(Switzerland), Ganesh Mahotsav(India), ARS Musica(Germany) etc and was awarded numerous awards including “Surma ni” , California Institute of the Arts Scholarship. Already at this young age he is well appreciated by his audience and critics for his artistic aspects & nuances of diverse styles and a mastery of technical skill. His concerts are always smarked for their aesthetic appeal and improvisation blended with a fine command of technical expertise. Rajib is an instrumentalist with an unique musical sense, innovative skills and the touch of swift, agile fingers. Be it at his Indian Classical Music Concerts or his World Music Concerts, he can almost immediately mesmerize audience of all ages. Awarded title “SURMANI” by Sur Singar Samsad, Mumbai in the year 2010.